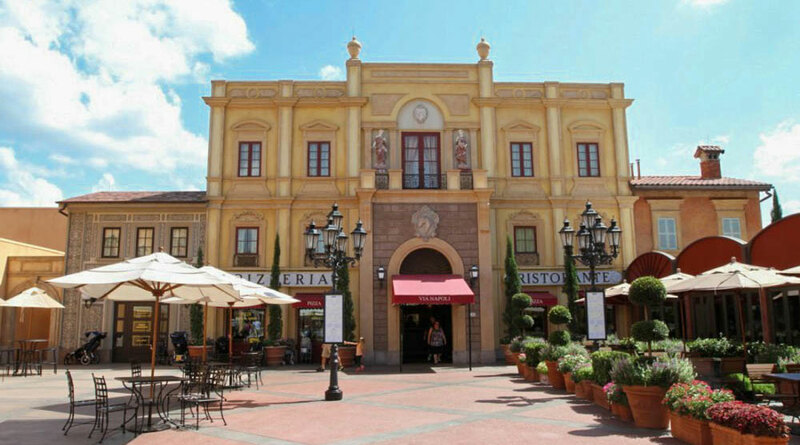 There are 2 choices for Italian food in Epcot: Tutto Italia and Via Napoli. 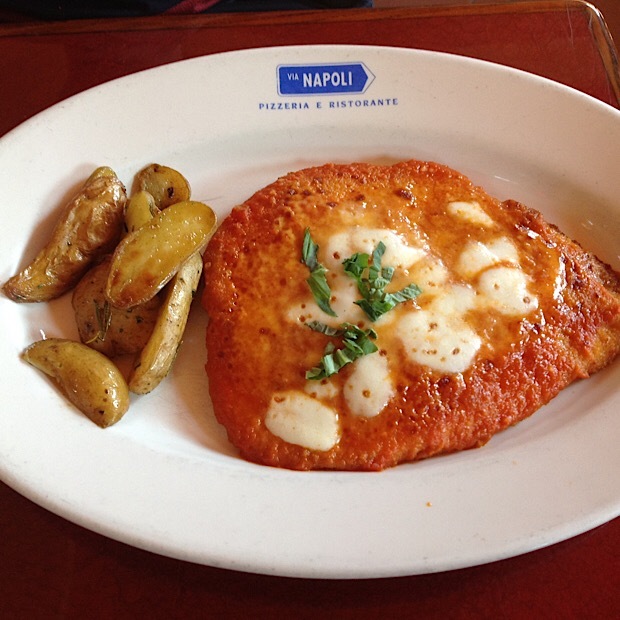 If you enjoy authentic pizza, then Via Napoli is the place to go. They are known for their 1/2 meter pizza. It’s huge! I’ve had the opportunity to try much of the menu here. I would recommend the Pollo alla Parmigiana (chicken parm), Lasagne Napoletana, and of course, the 1/2 meter Mezzo Metro. The chicken parmesan consists of breaded chicken breast, tomato sauce, parmesan, and mozzarella served with spaghetti pomodoro for $26.00. This is a full chicken breast (both sides). The chicken is a quality piece of meat — very tender and juicy. The marinara is rich in flavor, definitely not from a can. The spaghetti that accompanies it has been very dry on a few occasions. That is the only negative of the meal. 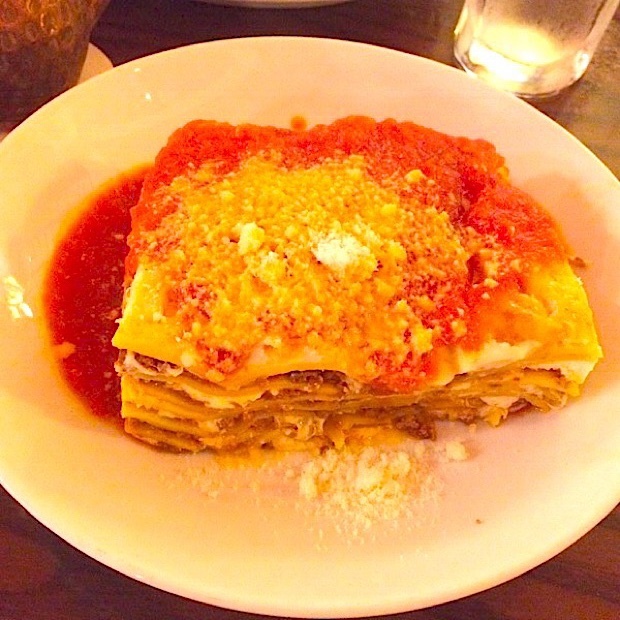 The Lasagne Napolenta is a unique take on classic lasagne. This entree consists of beef, veal, and pork ragù, fresh egg pasta, bechamel, baked in their signature wood-fired ovens. This entree is $27.00. I must say that the mixture of beef, veal and pork as a meat sauce is something to try. If you’re not a veal person, it’s okay because you really don’t notice it. The pasta holding it together was a good texture; they don’t burn it or overlook. How many times have you had homemade lasagne and you get served that burnt corner piece or the overcooked serving? Not here! This a pretty decent portion size — it will fill you up. You’ll be sure to receive a large serving of lasagne. 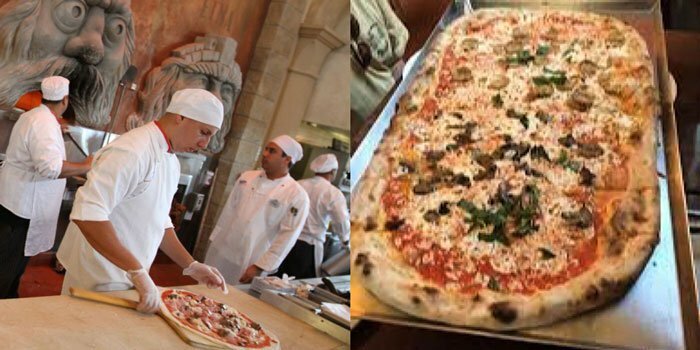 This brings us to the 1/2 meter Margherita Pizza. I will preface by saying that Disney has added a few other places that offer a decent wood fired pizza. They still don’t live up to this one. This pizza is made up of tomato sauce, mozzarella, basil with the option to add toppings. The price is $39.00. It is a basic cheese pizza in theory; however, because it’s cooked in a 900 degree wood burning pizza oven, they use just enough mozzarella and sauce to have a nice consistency. So many times I’ve had a pizza with too much sauce or too much cheese. Theirs is close to perfection. I will say it can feed roughly 3-5 people, depending on the type of eaters they are. I have two young kids that will just have a couple squares. My wife will have 3-4 squares. The rest — I’m left to finish. It’s well worth the price; it goes a long way. They also offer personal-sized pizzas if you prefer. Those are between $16 and $25.00. The larger pizza is the way to go. Dessert time! It’s an Italian restaurant. You must get the Coppa Brutti Ma Buoni or Tiramisu. Via Napoli gets those things right. The Coppa Britton Ma Buoni (the ugly but good sundae) is awesome. 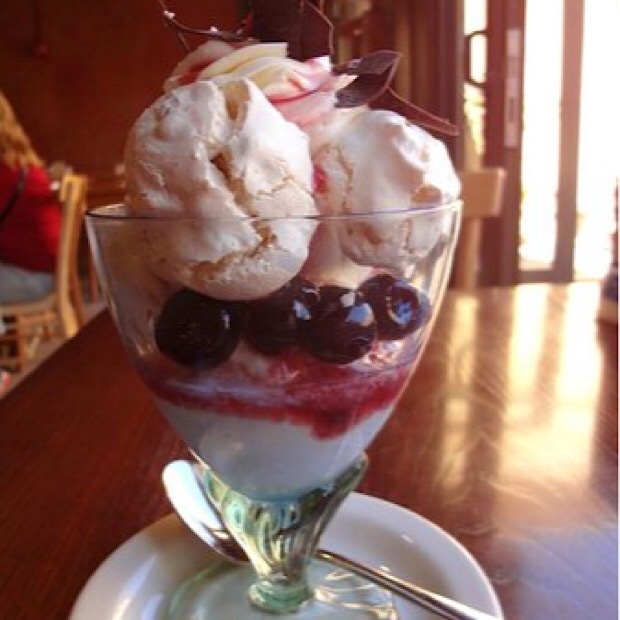 It features vanilla gelato, Amerena cherries, dark chocolate shavings and a cherry sauce. All for $14.00. A reasonable price for this item. The description can’t do this justice. You must try it, at least once. It’s one of the best desserts on property. My favorite is always the Tiramisu. This is made with mascarpone cream, espresso coffee, lady fingers, and chocolate. Where I live, we have an authentic Italian delicatessen. They make a fabulous tiramisu. Via Napoli rivals it. 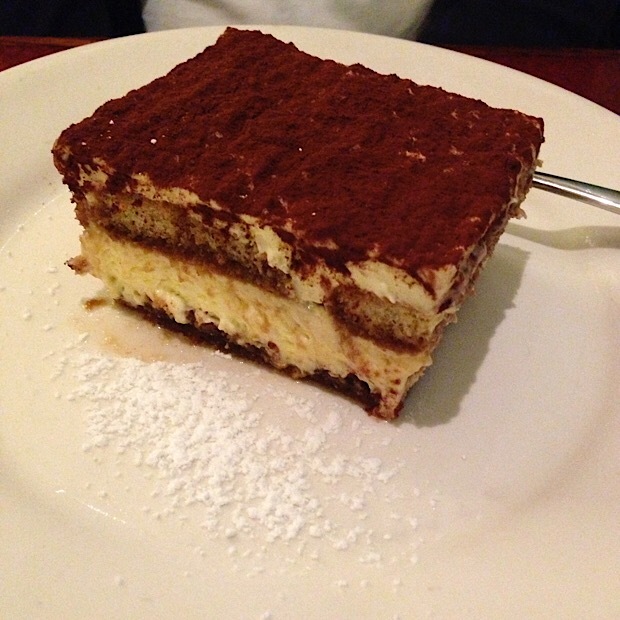 Restaurants can mess up tiramisu; it’s hard to do, but I’ve had it happen. The tiramisu here is very smooth. They use just the right amount of espresso and chocolate. They don’t go heavy on the mascarpone cream. The lady fingers are so light and fluffy, yet they hold all the ingredients together. Sometimes tiramisu can just fall apart when you put your fork in or it can just mush up. Not this one. It’s so perfectly assembled that when you put the fork to it, you are delighted with an even, well-held-together piece each time. All for $9.00. I would highly recommend the dessert. I’m not a huge wine drinker. This menu features plenty of wine and a modest selection of beer. Some American and some Italian. They do, however, serve an extensive amount of mixed drinks, many of them with an Italian twist. 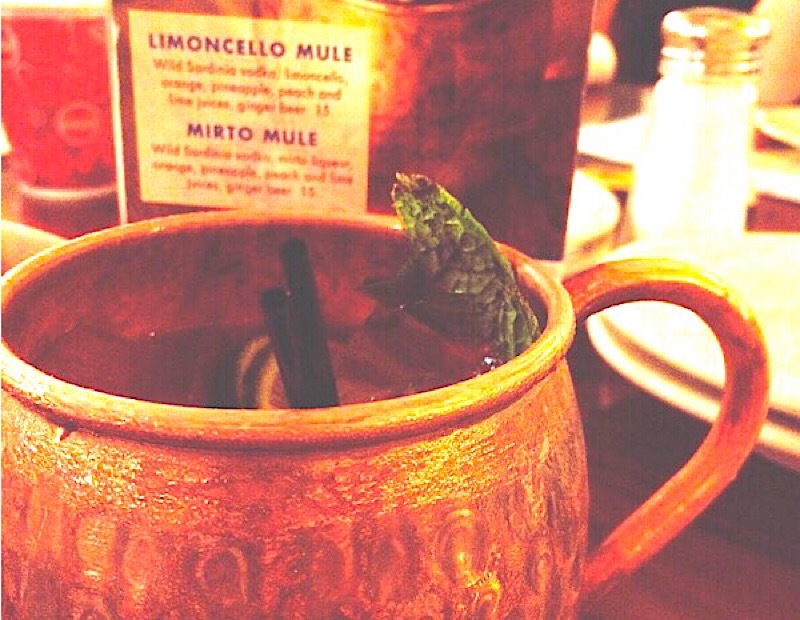 I personally love any “Mule-style” drink. While I can’t say I’ve tried a a lot of Via Napoli’s drinks, I have ordered the Limoncello Mule and it features the sweet lemon-flavored liqueur, ginger beer, lime juice, and of course, Mickey ears made with lemon and lime slices. I must say this drink is very refreshing and it doesn’t taste real strong of alcohol, but it is! At least the two I’ve had. It’s a great drink and well presented. It’s priced at $15.00. Finally, what the ladies have been waiting for: the manager and his water boys. If you read some review sites, you’ll read posts of Via Napoli’s water boys. No, I’m not joking, it’s a thing! During all of the hustle and bustle of this busy restaurant, the water boys are busy tending to everyone’s water. It’s like their thing. Great pizza and you’ll always have water. Every time we’ve dined it’s been the same general manager on duty. He’s great as well. Very attentive to each table and the folks waiting to eat. He and his staff will even pose for a picture with you. 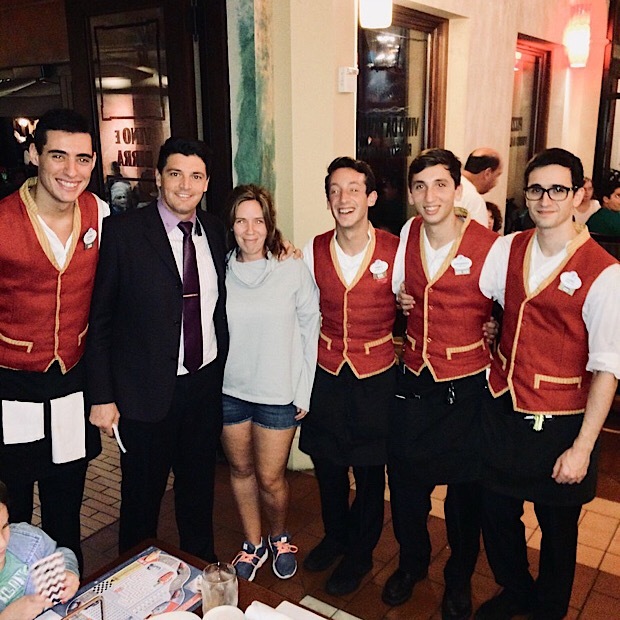 Overall, Via Napoli is as authentic as it can get, from the pizza ovens to the desserts, the water boys and the family-style atmosphere. 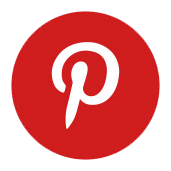 It’s a great place to visit — go more then once if you can. 5 stars for Via Napoli.